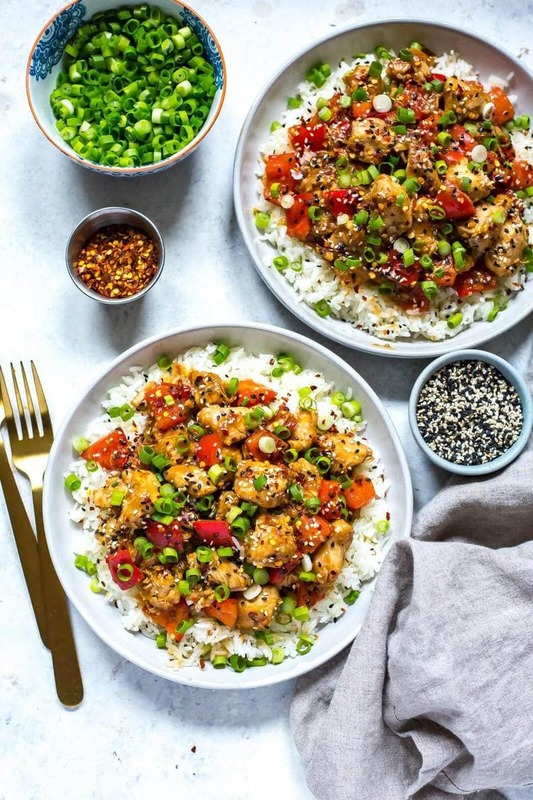 This Instant Pot General Tso's Chicken is a delicious alternative to takeout – you still get all the flavours of Chinese food that you crave but it's made in one pot with ingredients found in your pantry for a healthier twist! Get ready for a delicious takeout favourite made easy at home! 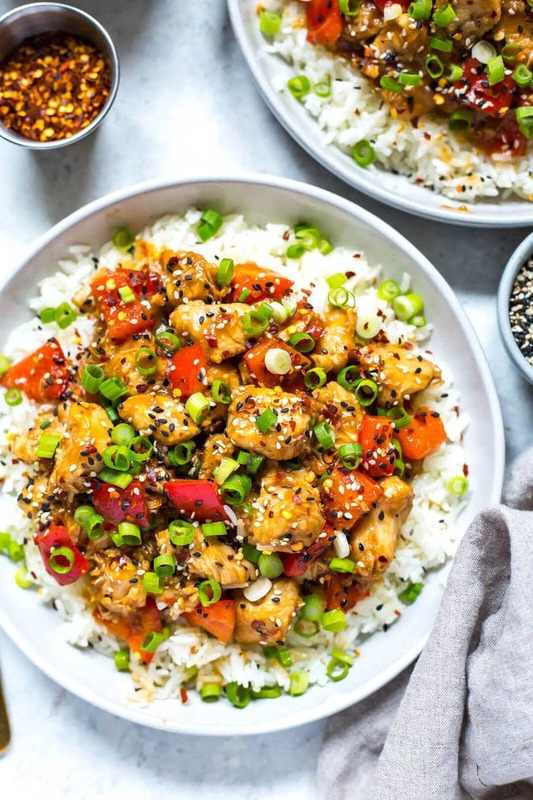 This Instant Pot General Tso's Chicken is a ridiculously easy version of homemade Chinese takeout but it comes together in one pot and is ready in just about half an hour! 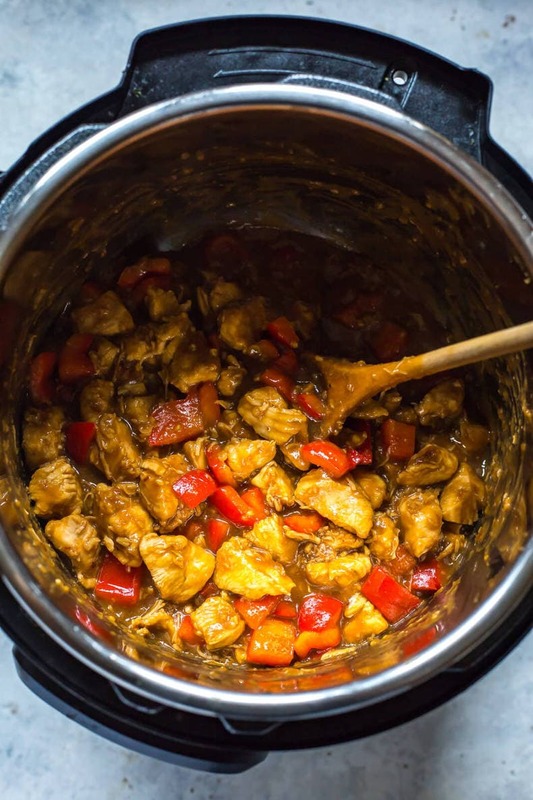 And even though I'm publishing this post in November, I feel like this Instant Pot General Tso's Chicken would also make a great dish to take with you on a camping trip! 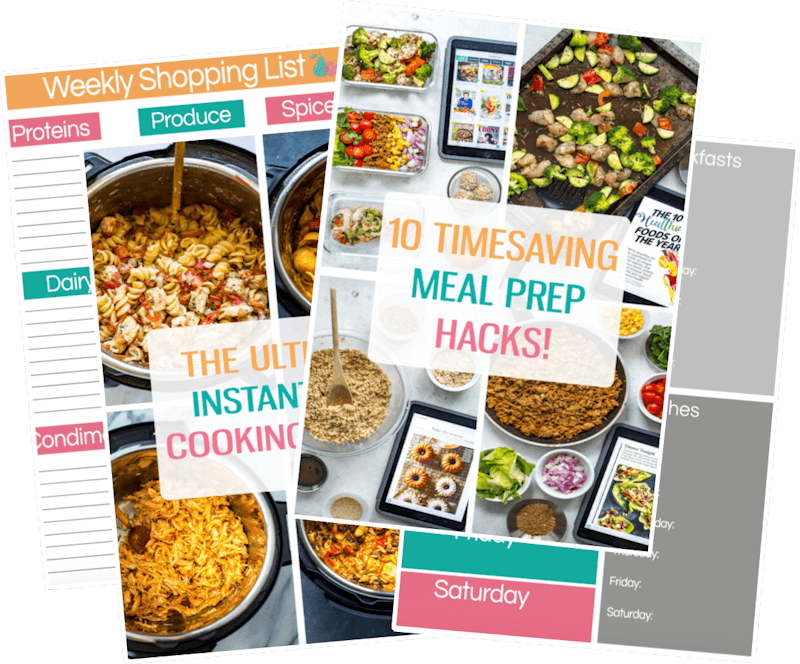 You don't need any stovetops or cooking elements – just your Instant Pot and a couple bowls! That's what pressure cooking is all about – even if you just use the saute mode this time. As I mentioned, you will be using mainly the saute function on your Instant Pot to bring this recipe together. First you will toss the chicken in cornstarch, which creates an easy breading-style coating for your chicken. The chicken will not take long to cook because it is cut up into small pieces so the whole hands on cooking process is only about 15 minutes. 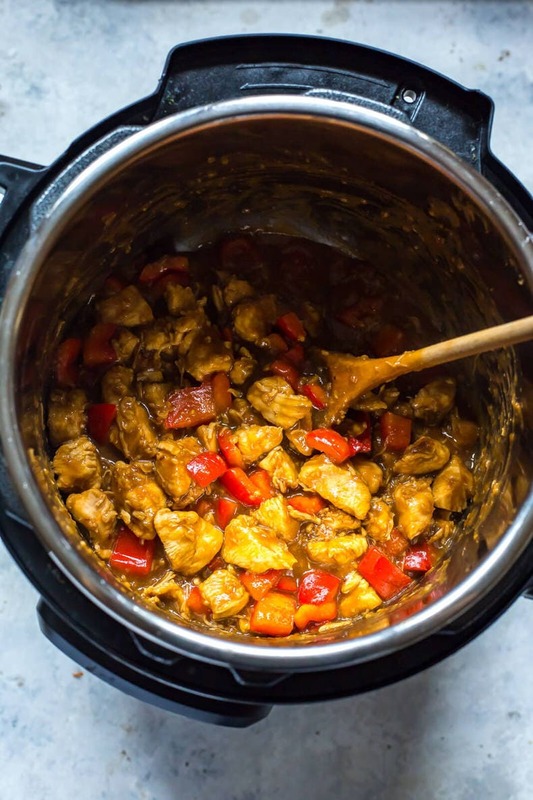 You can make the sauce while the chicken is cooking in your Instant Pot because it only takes 5 minutes with some pantry staple ingredients: a little bit of soy sauce, brown sugar, rice vinegar, sesame oil and lots of hoisin sauce and garlic. Very simple right?! Once the chicken is mostly cooked through, it's time to add your sauce and red peppers. Typically General Tso's Chicken is not made with any other kinds of veggies but I wanted to add a bit more colour to the dish and I really value getting in that extra nutritional boost. I was always taught that a meal is not complete without a starch, protein and veggie so by adding the red pepper you really do turn this into a whole meal, no side needed! And throwing the red pepper in at the end just makes it so easy to get a serving of veggies. You could also try adding spinach, kale or broccoli too! 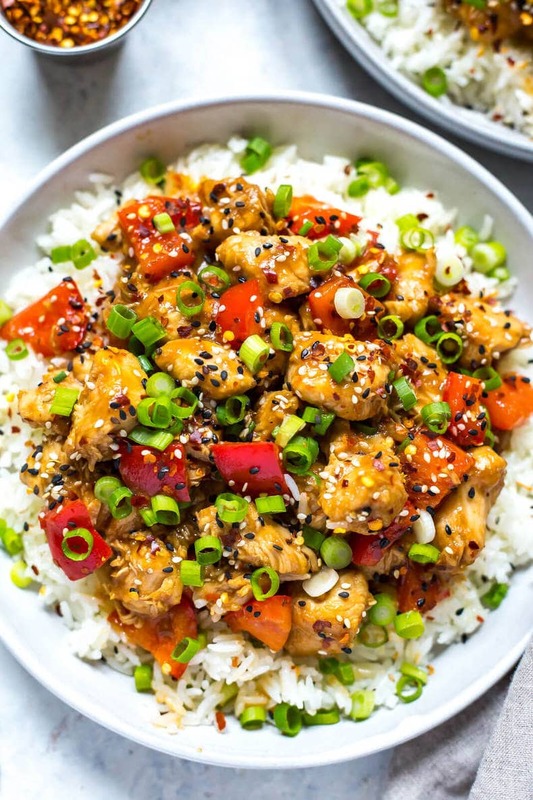 Technically there is also a great way to make this Instant Pot General Tso's Chicken a full dump meal and that is to add the rice in with the chicken and sauce! 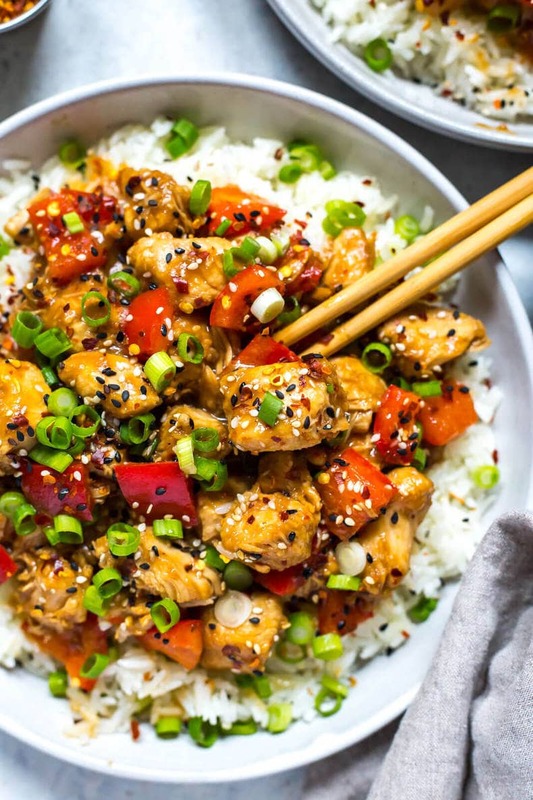 Dump everything into your Instant Pot except for the red peppers, green onions, sesame seeds, chili flakes and dry rice, then add 1 cup chicken broth (or water) and 1 cup of dry jasmine rice. Cook on high pressure for 3 minutes, and then stir in the red peppers and leave it to sit for 5 minutes or so just so the peppers get cooked a little by the residual heat. Super easy and a great way to be more hands off! But if you do want the sauce to be thick and sticky just like traditional General Tso's Chicken then I do recommend doing it all on saute mode. 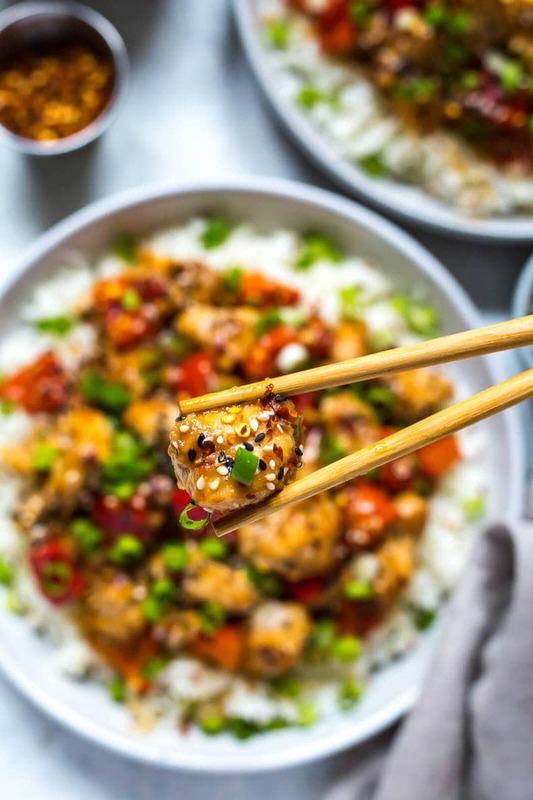 Will you be making this Instant Pot General Tso's Chicken? It's such a delicious twist on takeout! If you want more takeout-inspired options made in your Instant Pot, check out these Instant Pot Chicken Teriyaki Bowls or this Instant Pot Beef & Broccoli – they're both so good! 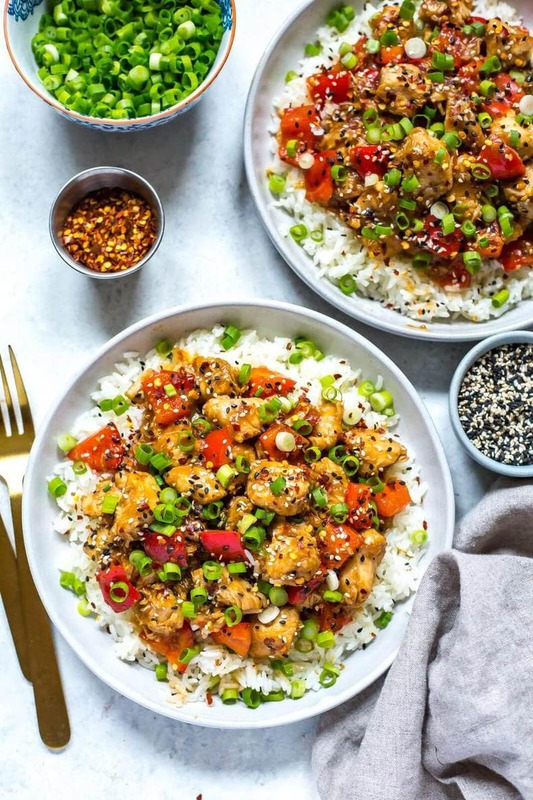 Grab some glass meal prep bowls if you plan on packing this Instant Pot General Tso's Chicken up for lunch! And of course I get all my free-range chicken from Butcher Box! 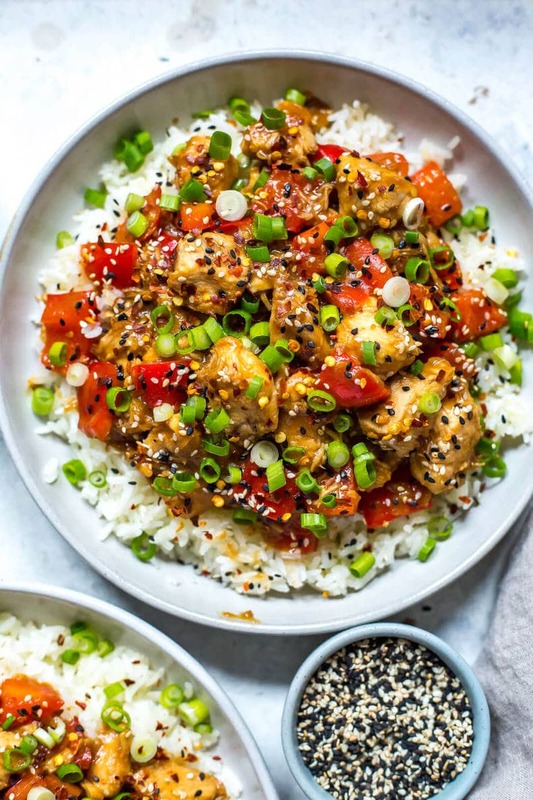 This Instant Pot General Tso's Chicken is a delicious alternative to takeout - you still get all the flavours of Chinese food that you crave but it's made in one pot with ingredients found in your pantry for a healthier twist! In a large bowl, mix chicken and cornstarch together. Meanwhile, preheat Instant Pot on saute mode and cook rice according to package directions in a rice cooker. Mix hoisin sauce, soy sauce, brown sugar, rice vinegar, sesame oil and garlic together in a small bowl. Add vegetable oil to Instant Pot and saute chicken until lightly browned, about 6-8 minutes. Add sauce and red peppers, then cook another 3-4 minutes until peppers are tender and chicken is heated through. Top rice with chicken and peppers, then garnish with green onions, sesame seeds and chili flakes. Serve and enjoy! This was so delicious I don’t have an instant put so just cooked my chicken in the pan then poured the sauce over worked really well. Excellent did it my my insta pot last night! I’m confused. Why is an instant pot required for this recipe? It’s not required, you can make it on the stovetop too. 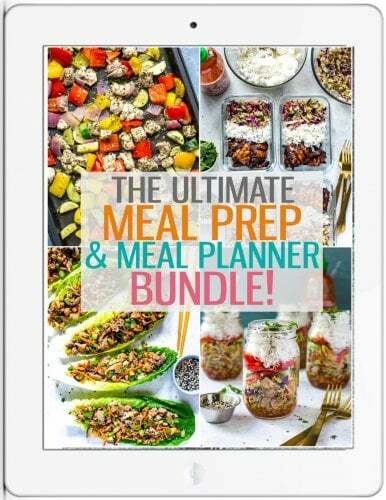 This is an option for those wanting to make it in the Instant Pot. Some people travel with their Instant Pot and don’t have access to a stovetop or some people prefer to cook using their Instant Pot instead. Made this according to directions. My husband and I loved it!